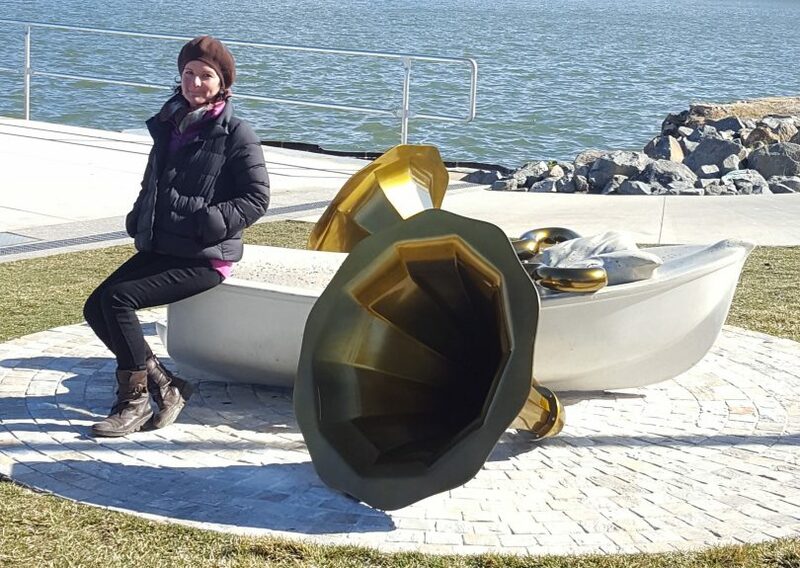 Hannah Hoyne with her Crying Dinghy interactive sculpture by the lake. Photos: Supplied. 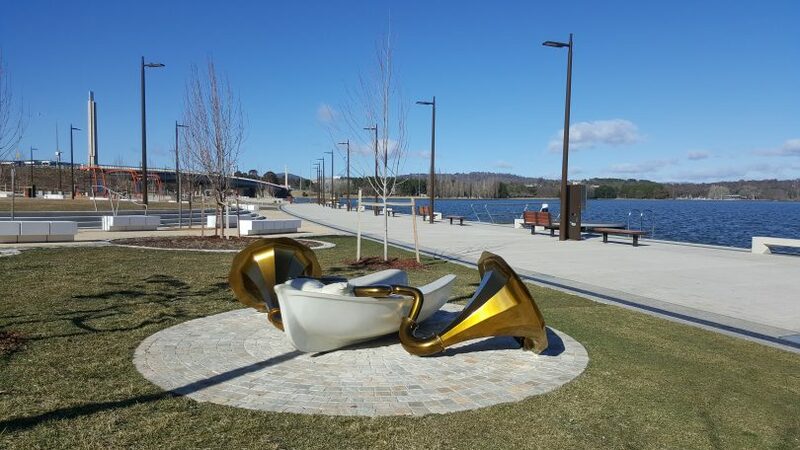 A new interactive sculpture by prominent local artist Dr Hanna Hoyne has been installed at Henry Rolland Park, on the shore of Lake Burley Griffin at West Basin. Crying Dinghy is part of Dr Hoyne’s Cosmic Recharge series, which have featured in Sydney’s Sculpture by the Sea and at the University of Canberra. Dr Hoyne won the prestigious Helen Lempriere Award in 2016 and the Cosmic Recharge sculptures invite people to imagine some part of their own interior lives by connecting their physical bodies to the object, the City Renewal Authority said in a statement. “The Spirit Recharge Vessel Crying Dinghy is a kind of anti-hero work in the Cosmic Recharge series,” Dr Hoyne said. “It talks to our individual vulnerability, our need to communicate it, but also to the idea of rescue, safety and inner resourcefulness. “I created this artwork to be relevant to the civic consciousness of people living in a capital city. To ponder how we relate to ourselves and others around us, while seeking recreation and rejuvenation at the edge of the water. City Renewal Authority chief executive Malcolm Snow said the sculpture would complement the other facilities and landscape features in the first stage of the West Basin redevelopment. “Great cities around the world have a rich fabric of both permanent and temporary artworks throughout their public places,” Mr Snow said. “The City Renewal Authority recognises the important contribution urban art makes to the life of the city. Crying Dinghy will be a great addition to the park’s urban setting. “Unlike other artworks, people are encouraged to play, touch and interact with the sculpture. Hanna Hoyne’s collaboration with Redbox Design and UAP was selected following a tender process for a new public artwork costing $100,000. Included as part of this process was mentoring and support from both companies to foster Dr Hoyne’s creative talents. No, it’s a hardly used, wind blasted patch of concrete and mulch adjacent to a busy road which the government has wasted hundreds of thousands on. And now a $100K sculpture installed in a spot where $100K of damage took place a while ago. Please remove it before it costs the taxpayer even more.